08/04/18 Mirror photo by Patrick Waksmunski / Penn State cornerback John Reid answers questions during media day. 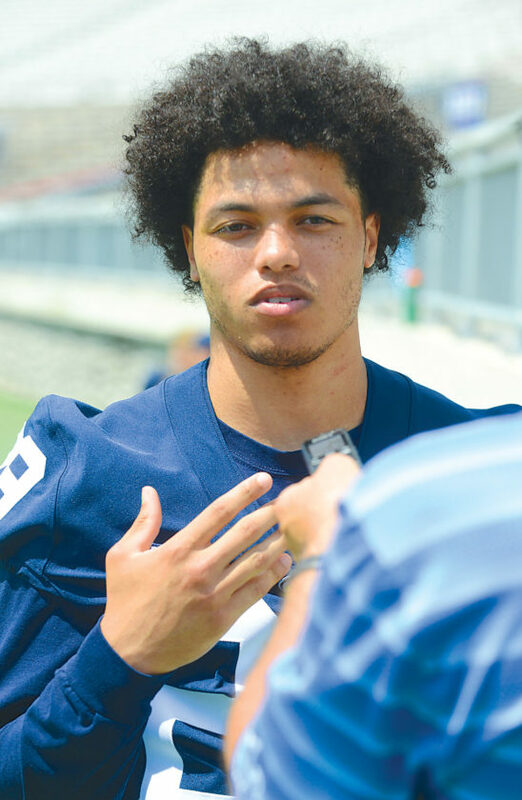 UNIVERSITY PARK — Penn State cornerback John Reid was named to ESPN.com’s Big Ten All Freshmen team in 2015 after becoming one of only four true freshmen to start for the Nittany Lions. Reid followed that up as a sophomore by making 36 tackles, including five for loss, and breaking up nine passes. He garnered All-Big Ten honorable mention status by the coaches and media. Reid was set to have a big 2017, but he tore the ACL in his left knee during a non-contact drill in April. So, he had to take a medical redshirt and sit out the entire 2017 season. “It’s not fun,” Reid said of sitting out last season, “but it’s kind of something that’s out of your control. I made the best of the situation, I felt like. “During the season, I was just more focused on helping my teammates out and doing what I needed to do during the day to make sure I’m improving every day. How did he help? He was like a student coach, even traveling with the team on the road. “Just giving them an extra eye to help them out,” Reid said on media day. “I was in their same position a lot of those times. I know what it’s like when a receiver is pressing on your toes and how you can react. “One of the biggest perspectives I gained is how our defensive coordinators and guys on defense are making the play calls. When you’re on the field sometimes you’re thinking ‘How are they making these calls?’ But hearing them how they analyze the game definitely helped me out a lot. Reid watched as all four starters in the secondary — Marcus Allen, Troy Apke, Christian Campbell and Grant Haley –played well enough to either be drafted or signed as free agents by NFL teams. He bided his time and tried to make his teammates better. Reid is known throughout the program for spending an amazing amount of time watching game film. “He handled it in a very mature fashion,” cornerback Ayron Monroe said. “He didn’t just out there and sulk. He attacked his treatments. He attacked getting better every day, whether it was on or off the field. Reid is healthy now, and he’s looking to pick up where he left off. He’ll even be returning punts after leading the Lions in with a 7.5-yard average in 2016. Reid is just happy to be out on the field again. He hasn’t played in a live game since the Rose Bowl in 2016. The 5-10, 185-pounder says he’s had to make adjustments in his game since he last time he played. “I had a lot of that time to make adjustments, spring ball to summer and even a little bit of stuff we did in winter conditioning,” Reid said. “I’m just back to getting my technique right, like I do every summer. It was pretty much like a regular summer for me. Named to the Dean’s List as a freshman, the Mount Laurel, N.J. native is a very intelligent young man. He built a computer from scratch while he was attending Saint Joseph’s Prep. On the field, he led his team to two PIAA titles in 2013 and 2014 and was named Pennsylvania Football News Defensive Player of the Year. Last summer, he interned at technology leader Intel. This summer, the data sciences major stayed closer to campus to work. Reid, though, will be focusing his bright mind on football this fall. He’ll likely be one of the starters in a secondary that has a lot of holes to fill. Monroe, fellow cornerback Tariq Castro-Fields and safeties Nick Scott and Lamont Wade have the most experience returning in the secondary. Asked what his goals were, Reid had a team-oriented answer. Penn State opens the season on Sept. 1 at home against Appalachian State. That matchup might not carry a lot of excitement for many college football fans, but given Reid’s missed season, he’s looking forward to the season starting against any team.